Bangkok, Thailand (CNN) -- The death toll from the weekend's clashes between anti-government protesters and Thai security forces climbed to 21, authorities said. Of the dead, 17 are civilians and four are military, the Bangkok Emergency Medical Service said Sunday. 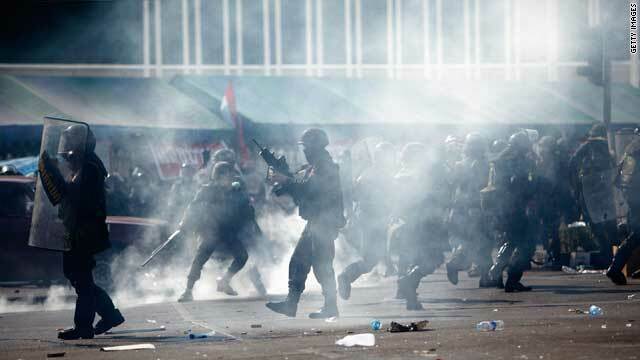 The clashes on Saturday also left 858 injured, the service said. The protesters, known as the "Red Shirts," for their clothing, organized a funeral ritual for their members at Phan Fa Bridge on Sunday. Thousands of protesters attended. In addition, the protesters seized six military vehicles, smashing their windows, and blocked part of the major Pinklao Bridge. The government, meanwhile, said it was asking officers to return to their bases to refresh and prepare for the next operation. The protesters' group, the United Front for Democracy Against Dictatorship, said it is unwilling to sit down for negotiations with the government unless it is to discuss the dissolution of the lower house of parliament. The anti-government protesters have been demanding for days that Prime Minister Abhisit Vejjajiva dissolve the parliamentary body and call new elections. In addition, Red Shirts leader Weng Tojirakarn said the group wants the prime minister to leave the country. Are you there? Send an iReport on what the scene is like there. As noon approached, a group of about 100 Red Shirts gathered in front of a satellite center compound, successfully getting it to lift a government shutdown of the opposition television, People Channel Television (PTV). The compound distributes a signal for PTV, the primary communication channel between the Red Shirt leaders and the group's supporters in the provinces. The government shut down the station, saying it was spreading misinformation to Thais. Clashes broke out Saturday when military and police forces used tear gas and rubber bullets to contain protesters who were trying to break into military barracks. Among those killed was Hiro Muramoto, a Japanese cameraman with Thomson Reuters, state media said. Royal Thai Army spokesman Col. Sansern Kawekamnerd told reporters that security forces only fired real bullets into the air to scare away protesters. He said the demonstrators fired real bullets at the security forces, and that many security officers were injured. The protesters kidnapped six soldiers, Sansern said. Two were later released, he said. After the bloodshed, the Red Shirt protesters and the military declared a temporary truce. It was not immediately clear how long the truce will last. Earlier this week, authorities issued a state of emergency, allowing the military to break up large gatherings. The state of emergency also permits authorities to take certain actions, including arresting and searching people, without court orders. The demonstrations have plunged Thai stocks by more than 24 points, or about 3 percent, after the government declared the state of emergency. The anti-government group is comprised of supporters of former Prime Minister Thaksin Shinawatra, who was ousted in a bloodless military coup in 2006. He fled the country in 2008 while facing trial on corruption charges that he says were politically motivated. He remains hugely popular.